1/ during the victory day parade of 2016 , I was amazed by the quality and design of the tactical Vest 6Б46 worn by a formation of the 331th airborne regiment of the 98th airborne division , so I concluded that airborne & ground force Spetsnaz brigades will adopt this vest as standard issure tactical and bulletproff vest , but in recent photo of paratroopers training in egypt , the soldiers were wearing 6Ш117 equipement vest , so i'm a little bit confused , the 6Б46 vest will be adopted by all elite units or some of them ? 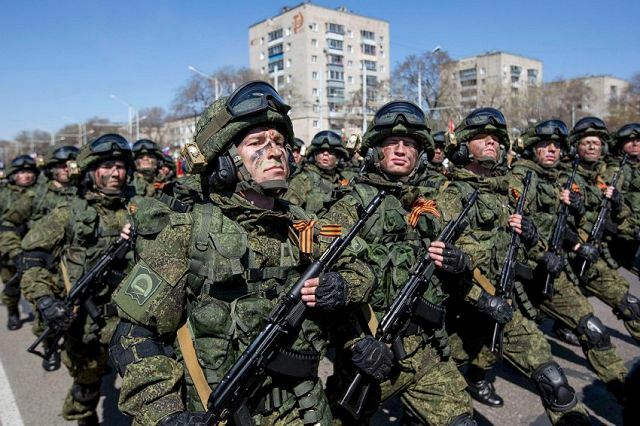 2/ In recent statements , we say that as for september 2016 , 100.000 ratnik 's were distributed across russian army , when we say 100.000 , it's the whole system or the bulletproof vest & helmet only ? It's just gradual intro like usual. I think that it is the whole system minus the BMS which AFAIK is a fireteam asset. Both 6Ш117 and 6Б46 seem to have been introduced at the same time into different units during last 2 years, so i assume gradually during next or in 2 year period 6Ш117 will stop being obtained in favor of 6Б46. Guessing here. Complete uniform, helmet, body armor, west and com equipment is issued. Upper lvl com equipment, BMS, certain optronics etc is either not procured at the moment or is issued on fireteam, company, batallion lvl as intended, but it depends on the units. Ratnik also still does not have unified some of its equipment so different units end up having same uniform but different optronics etc. Advanced synthetic materials used for body armor and helmets of Russian Ratnik-3 combat gear. Advanced synthetic materials will both protect troops and slash the weight of the body armor and helmets to be used as part of the Ratnik-3 future soldier combat system, according to the Izvestia daily. The Russian Defense Ministry and Rostec Corporation intend to start making body armor, accoutrements and uniforms out of unique super-lightweight and strong materials designed for use as part of the third-generation advanced soldier combat system tentatively known as Ratnik-3, which research has begun earlier this year. The advanced research program was officially launched in January 2016. It is an in-depth pilot research designed to devise a concept of the third-generation soldier system. One of the key lines of research is the development and production of sophisticated materials, a Defense Ministry official close to the program says. In particular, a decision was made to introduce new-generation aramid fibers for making uniforms and accoutrement elements and to make body armor and helmets out of ceramic armor based on boron carbide. The results of the research will be used in both the future third-generation soldier system and the elements of the recently developed Ratnik-2. The advanced materials are believed to be able to slash the weight of other gear as well without affecting its strength, the Defense Ministry official says. 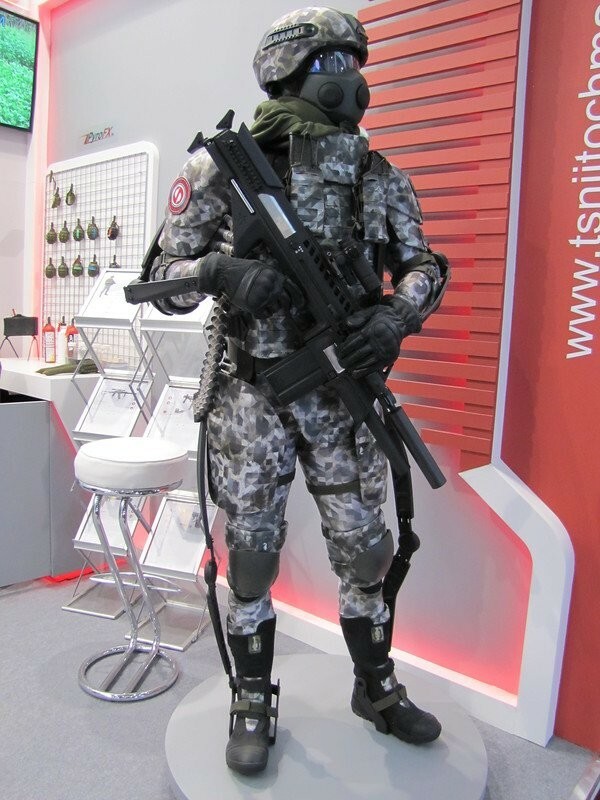 While the current body armor, including the groin, forearm and neck protectors, weighs around 15 kg, the development work in progress is expected to gradually reduce the weight by 20-30%. Aramid fibers are synthetic polyamides, which chemical and physical microstructure affords them unique thermal stability, i.e. the ability to retain their chemical and physical properties despite an increase in temperature. The best-known aramid fibers are Kevlar, Nomex and Twaron that have been used for making clothes resistant to 250-700°C for over 30 years now. Russian manufacturers use the domestically developed Ruslan aramid fiber. The advanced research has proven that the Russian is unable to meet some of the requirements. The Rusar-S fiber has been recognized as promising. It is made by means of dry and wet spinning, which enables the products to retain their properties for 15-20 years, a Defense Ministry official participating in the program says. Although the aramid fiber has been called promising, its current output is sufficient for experimental purposes only. Therefore, the feasibility of its mass production in Russia is being studied now. Another promising material, which the Defense Ministry plans to use as part of body armor inserts and helmets, is boron carbide - black crystals resulting from fusing boron and carbon. Currently, foreign protective kit manufacturers use aluminum oxide, silicon carbide and boron carbide to make inserts. Aluminum oxide inserts, which price averages $250, are considered to be the lightest and cheapest ones. At the same time, a similar boron carbide product is 20-30% lighter but costs at least $500 due to the complicated manufacturing methods involving chemical reduction. Until recently, boron carbide has not been produced in Russia. However, the B-Force and NEVS-Soyuz companies have started its experimental production, the Defense Ministry official told the Izvestia daily. ROSTOV-ON-DON, January 27 /TASS/. Russian troops will get more than 50,000 Ratnik-2 personal combat uniform kits in 2017, Land Force commander Col. Gen. Oleg Salyukov has said. "In 2017, the Russian armed forces plan to purchase 50,000 second-generation Ratnik gear kits for servicemen of the Land Force, Airborne Troops and the marines of the Russian Navy," Salyukov said Thursday. Salyukov said earlier that an advanced Ratnik-3 combat gear with an integral exoskeleton and a helmet visor-mounted target designation system is currently being developed for Russia’s Armed Forces. It's just a propped Vycholp. The idea was to give a futuristic outlook. Hence no magazine and oversized magwell. I think the funniest part is that they used the actual new rifle mag as the shotgun magazine. What I love about Ratnik that it gets tweaked countless times as they are now listening to soldiers feedback and comparing to foreign systems. Even if not widely deployed as a whole it already has future versions in the pipe. Very glad to see Russian army becoming dynamic when it comes to infantry equipment. I also like the fact that it is now considered a system rather than individual pieces that might get upgrades or not depending on how important they might seem. By treating them as a system several different items can be integrated together to form multipurpose things. An obvious example would be to combine the functions of optical sights for day and night observation and sighting weapons. Electronics for communication and navigation are also interesting in that regard too. Years ago a map and compass and a radio, as well as binoculars and a rifle scope and night vision goggles would all be carried separately. MOSCOW, June 2. /TASS/. Russia’s Ratnik "soldier of future" combat gear excels foreign rivals by armor protection and surpasses domestic variants by all parameters by two or three times, Defense Minister Sergey Shoigu said on Friday. "Let me note that the combat gear excels existing domestic variants by two or three times by its characteristics. Moreover, it is no inferior to foreign rivals and excels them by a number of positions, in the first place, by armor protection," the defense minister said. "As a result, the provision of alert units and formations with modern combat gear makes up 42% on average," the defense minister said. The new Ratnik gear is looking more and more like Robocop..
new Gear .. they adding new stuff. with every new version. Check the shoes.. now are fully exo. This does not look like any ratnik gear released earlier by Russia. Does NATO have show any prototype that looks like that? Interesting, but that's not a prototype, that's a mock-up. KUBINKA /Moscow region/, August 23. /TASS/. The Ratnik combat gear has entered service, the delivery to the army has begun, Director General of Russia’s Central Research Institute for Precision Machine Building (part of the Rostec Corporation) Dmitry Semizorov said on the sidelines of the Army-2017 International Military-Technical Forum being held in the Moscow region. "Today, the Ratnik combat gear has entered service, the delivery to the army is underway," he said. According to Semizorov, all the issues that users may possibly face are immediately dealt with. The Ratnik combat gear is a modular system consisting of ten subsystems, which can be modified depending on a combat situation, weather conditions and other factors. The Ratnik system comprises more than 40 items, particularly small arms, helmets, body armor, communications means and GLONASS navigation equipment. The combat gear is being promoted as an outfit for the "soldier of the future."